Shakyamuni, the historical Buddha of our present era, is depicted here with his two main disciples, Maudgalyayana and Shariputra, who respectively stand to his right and left. These two attendant disciples wear the three monastic robes and carry the monk's attributes of a blue alms-bowl and an iron mendicant's staff. Shakyamuni is seated in vajra-posture upon a moon disc and lotus, his left hand resting in the gesture of meditation as he holds his alms-bowl, and his right hand extended downward as he makes the 'earth-witness' gesture. 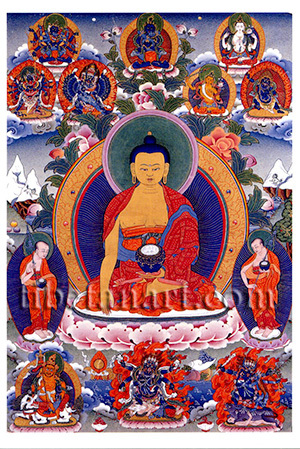 Above Shakyamuni is Vajradhara with his consort, who represents the dharmakaya aspect in which the Buddha manifests in order to reveal the Tantras. To the left of Vajradhara are the three main yidam deities that are practiced in the Tibetan Gelugpa tradition: Guhyasamaja (top); Chakrasamvara (left); and Vajrabhairava (right). To the right of Vajradhara are: Avalokiteshvara (top); Manjushri (left); and Vajrapani (right), the three great bodhisattvas who represent the compassion, wisdom and power aspects of all the Buddhas. Across the bottom are the three main protective deities of the Gelugpa tradition: yellow Vaishravana (left), Six-armed Mahakala (centre), and Yama Dharmaraja (right).